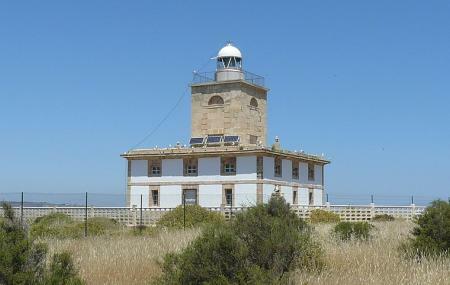 Faro de Tabarca is an ancient lighthouse located on the scenic island of Tabarca. The lighthouse was opened in 1854 and was served as a school of the lighthouse keepers. The lighthouse has two floors for housing purpose and a tower above them that holds the lighting mechanism. The lighthouse was built to warn the situation of the island since it lies amidst many rocks and rocky islets. When you reach the lighthouse you will be welcomed by panoramic view of the surroundings. Consider visiting this place if you have enough time to spare while you are in the neighbourhood. Create a customized plan for your visit using the Tabarca trip planner. You can use ready templates or start from scratch for the same. You can enjoy a comfortable stay in the city by booking the best hotels in Tabarca like Quatre Llunes, Casa Los Jardines De Lola, Bed And Breakfast Santapola and Bungalow En Santa Pola. Chalk out the best way to discover the city with Tabarca vacation packages. Check out various modes for how to reach Tabarca. Love this? Explore the entire list of places to visit in Tabarca before you plan your trip. Fancy a good night's sleep after a tiring day? Check out where to stay in Tabarca and book an accommodation of your choice. Cute little island 🌴. Great place to visit and to explore. Rent a jet ski, boat, or go scuba diving. Crystal clear water. Bring your own lunch or get something from the local restaurants. El pasear por esta isla y visitar su gato es algo que hay que hacer si o si. El paseo en barco para llegar hasta las isla es divertido y los paisajes de la costa sin precisos. Es una gozada y se disfruta mucho del mar. El faro es muy sencillo y no muy grande. Se come muy bien en la isla y existen otros edificios que merece las pena visitar.